The Suites at Elmbrook features a beautiful restaurant-style dining area. Three delicious, dietician approved meals are served daily by The Suites’ staff. Menu updates are based on resident preferences and feedback. We also offer optional menu choices. 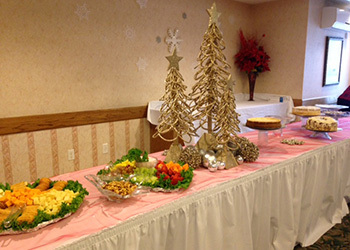 The salad bar is a crowd pleaser with offerings of fresh vegetables and seasonal items. Our monthly pizza parties and annual holiday gatherings with a party atmosphere are special times for our residents, their families and the staff.